If you’re like me, you might already have a pile of old electronics in your basement, waiting for you to figure out what to do with them. You haven’t put them out with the trash, because you know it’s a good idea to keep them out of landfills… But why is that? Researchers have known for a long time that the heavy metals used in batteries in these items could pose risks to human health or the environment if they leech out of the batteries into landfills, and from there into soil and groundwater.1,2 However, the use of nanomaterials in batteries is much newer, and therefore it is really important to understand what happens when these nanomaterials potentially find their way out of the batteries, reach a landfill, and eventually encounter the cell membranes of organisms in the environment! 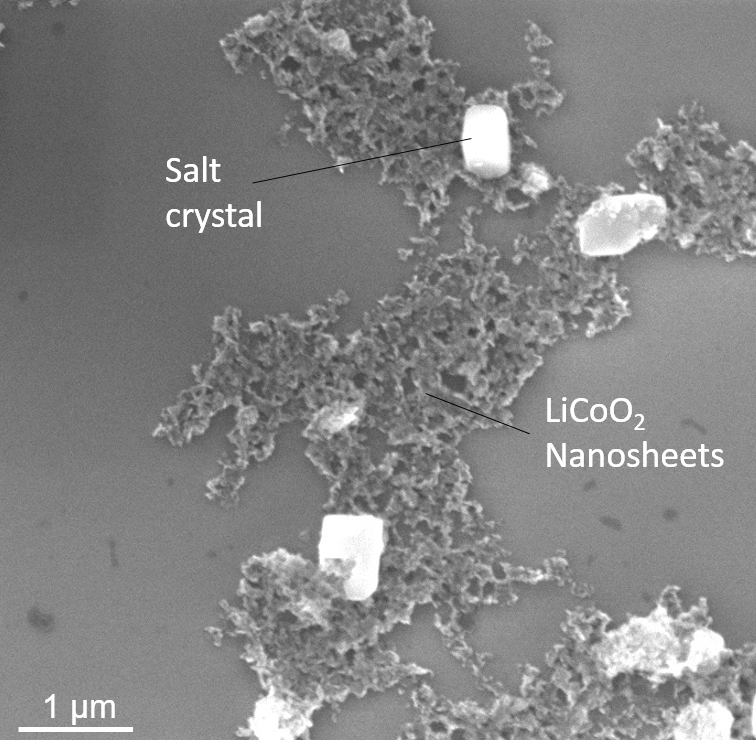 To help answer the question of what happens when these nanomaterials get into the environment, we recently published a paper called “Alteration of Membrane Compositional Asymmetry by LiCoO2 Nanosheets.”3 In this project, we primarily focused on nano-sized lithium cobalt oxide (LiCoO2), which is one of the simplest cathode materials that make up the + end of a battery. Batteries that use this material are one example of what are generally called lithium-ion (Li-ion) batteries. LiCoO2 is formed of sheets that are around 45 nm long. Our big goal here was to determine if these nanosheets pose a threat to cellular organisms. But just dumping a bunch of LiCoO2 in a vat with some bacterial cells would not actually help us here, because we wanted to know not only if the material is harmful, but why (or why not). In order to control some of the variables involved, we used idealized cell membrane models instead of real cells. As we’ve discussed on the blog before, scientists have been using lipid bilayers on solid supports as model membranes for quite a while. Because lipid bilayer is the major component of cell membranes, a model like this can help us identify the fundamentals of the nanosheet-cell interaction we were studying in this project. As Ian discussed in this recent blog post, particles attaching to the membrane can cause problems for the cell. So, our first step was to get images from an electron microscope showing whether the nanosheets were attached to the lipid bilayer. To do this, we formed a model lipid bilayer and exposed the bilayer to the LiCoO2 nanosheets in solution (mixed evenly throughout a liquid). Then we rinsed the bilayer with a nanosheet-free solution so that any nanosheets that were not stuck to the bilayer would be washed away. The microscope images showed that the nanosheets were attached on the bilayer even after rinsing, but these images didn’t give us a clue about why they got attached. Here’s what our LiCoO2 nanosheets look like under the scanning electron microscope! There are a few scenarios we considered to explain how the structure of lipid bilayers may change when they interact with nanomaterials. Remember that lipid bilayers are not rigid. With the nanosheets attached, the bilayer might become curved, it might become more fluid, or the lipid composition in each layer might change.5-7 But which scenario was it and what might be causing the interaction? In the search for an answer, we used a technique called Sum Frequency Generation Spectroscopy (SFG). SFG uses ultrafast lasers to look at molecules at the surface of a substance. Based on past research, we knew that electrostatics (positive and negative charges) play a huge role in how nanoparticles interact with cell membranes, so we investigated the charges involved in the system we were studying. We determined that the LiCoO2 nanosheets have positive surface charges by themselves in solution. Then we varied the composition of the lipid bilayer to have different charges so we could see if that changed how the bilayer interacted with the positively-charged nanosheets. What we learned helped us understand the interaction between nanosheets and lipid bilayers much more clearly. As you may remember from your high school physics classes, in the world of static electricity, opposite charges attract and like charges repel each other. This law from the 18th century helped us figure out that the positively charged nanosheets were attracting the negatively charged lipids, producing an asymmetry in the membrane. 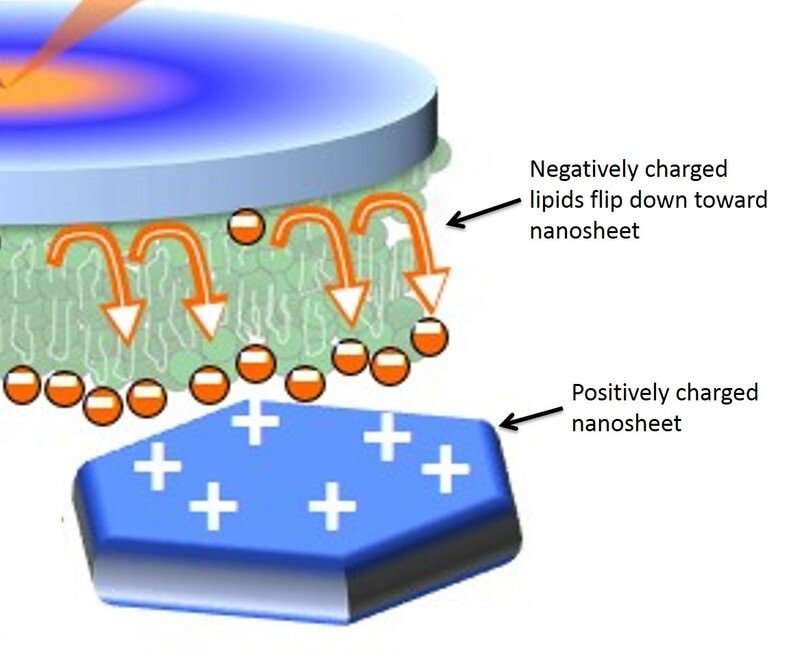 In other words, more negatively charged lipids would be pulled closer to the nanosheets, causing the lipid composition to be different in the top half vs. the bottom half of the bilayer. What do our results from model membranes mean for real cells? In multicellular organisms, we observe a natural change in lipid asymmetry when it’s time for a cell to die. Macrophages (so-called “vacuum cleaners”4) take the asymmetry as a signal to clean away the cells. This is called programmed cell death and it is essential for the development of an organism. In fact, this is the only way that the remaining cells function well. However, if the same signal could be accidentally triggered by a nanomaterial, the macrophages won’t be able to distinguish the difference between programmed cell death and cells with nanoparticles stuck to their membranes – they could clean up the cell that encountered the nanomaterial even if it’s not really time for the cell to die. Remember that our findings here are based on idealized model membranes. These simplified systems help us better understand the possible biological consequences of introducing large scales of these materials into the environment. Although we cannot conclude that LiCoO2 nanosheets kill cells, this study of model membranes suggests that the nanosheets may have the potential to be harmful in real cells. We are currently working along with other labs to expand this research to living systems. The next steps of research will be to build on model studies like ours to start investigating the effects of nanomaterials that are used in Li-ion batteries on more complex living systems. 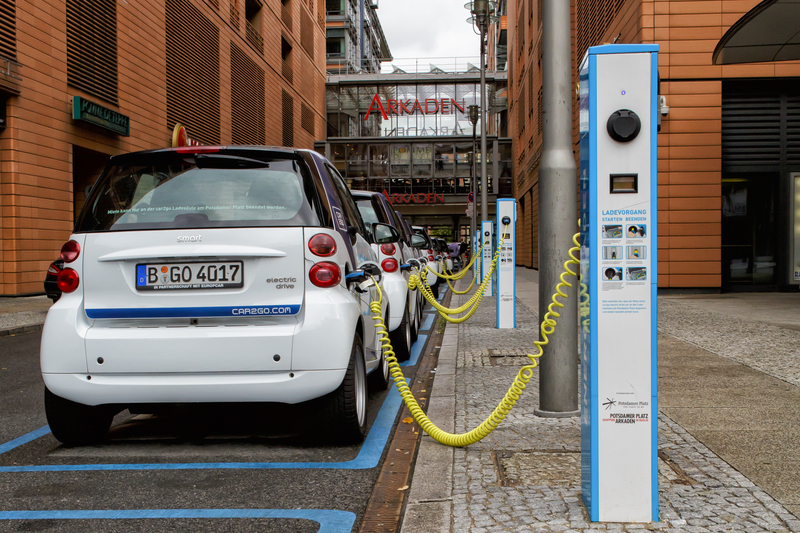 Li-ion batteries are already widely used to power your smartphones, laptops, and some electric cars. Based on the research I’ve described here, I hope I’ve convinced you that it is worthwhile to think twice before throwing these energy storing units in the trash. By saving them for recycling, you can help avoid any potential adverse environmental impacts.